Battery Life Percent has a Value from 0 to 100 indicating the percent charge of the battery in the UPS. A value of 255 indicates the percent is unknown. Battery Lifetime indicates the number of seconds of charge remaining in the battery at the current usage. A value of 255 indicates the remaining charge is unknown. The Battery Lifetime is often unknown unless the UPS is running on the battery. Battery Full Lifetime indicates the number of seconds of charge when the battery is fully charged. A value of 255 indicates the remaining charge is unknown. 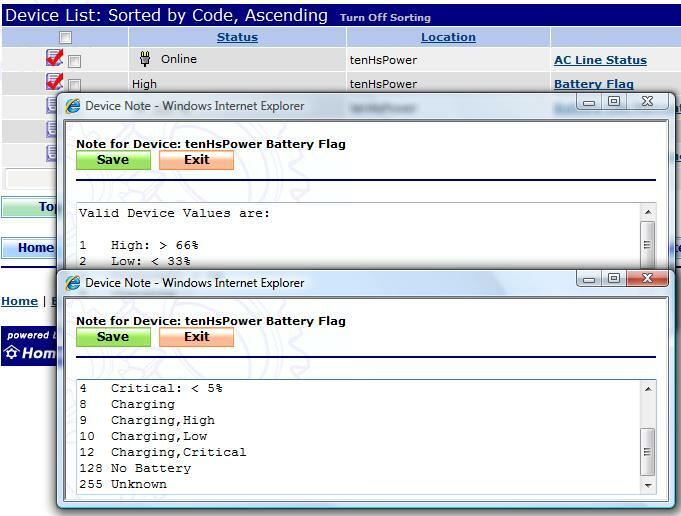 Battery Full Lifetime is often unknown unless the UPS is running on the battery.